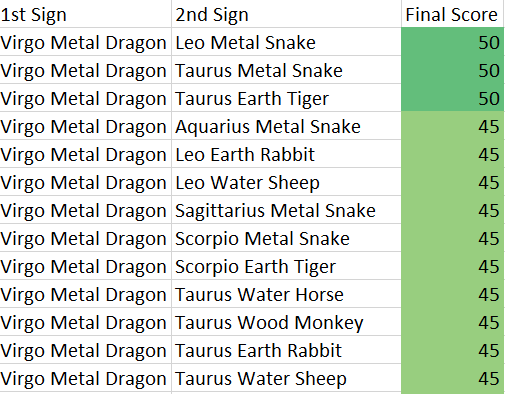 The Virgo Metal Dragons are born with an analytic mind. No matter how complex things become, they are able to see straight to the logic. They are intelligent which gives them a great memory and can absorb facts and details at a high capacity. The VMDs are a determined character and will be focused on reaching their goal. They are self-reliant and will be able to get through difficult situations by themselves. Virgo Metal Dragons are one of the most ambitious signs, they will do whatever it takes to obtain what they want. They are one of the most energetic signs which keeps them ahead of the game. On the other hand, Virgo Metal Dragons can become fussy, meaning they can get caught up with details which they must find sense before letting go. They are conservative in which they are not the type to accept different or try risky and new things. The VMD can become an unyielding person. If you wrong them in any way, guess who’s going to have to be the first one to apologize. They can be impulsive and will do and act on their feelings more than using their logic. Virgo Metal Dragons are arrogant which they think they are better than others. Worst of all, they can be demanding of others, making it very difficult for people to get along with them.